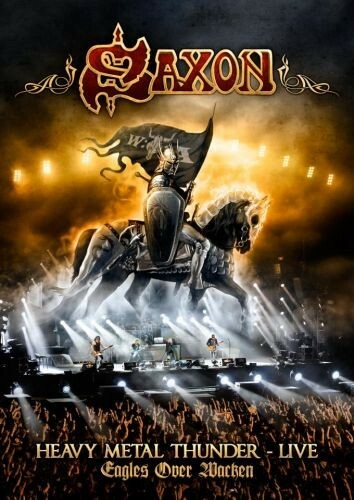 Good though both are, if you were to push me to decide which you ‘need’, then I’d have to plump for this fantastic DVD, which is a stunning celebration of Saxon and their heritage. The idea of splicing performances from these three separate years together may sound a little contrived. However in practice it is a masterstroke, cherry-picking the strongest performances of key songs from Saxon’s long, fruitful career! Obviously the stage costumes change, but then so do the stage-sets, lighting-rigs and indeed the drummer (Jorg Michael (Stratovarius) was behind the kit in 2004, while Nigel Glockler had returned by ’07 and ’09). However this is actually a plus-point, as the ever changing back-drop and lighting (and Biff Byford’s varying degrees of grey-hairdness) constantly offer up something different to look at. Wisely as the expertly edited years jump back and forward, a little caption pops up at the bottom of the screen announcing the song and the year it came from. No one is actually trying to pretend that this all took place on one night. It all makes for fast, flowing viewing that never fails to hold your attention as you marvel at the energy with which bassist Nibbs Carter careens about the stage. The guitar pairing of Paul Quinn and Doug Scarratt peel off bristling riffs and stunning solos with ease and skill, while the sharp, multi-angle camera work keeps you right at the (Lion)heart of the action as it follows the evergreen Biff. Sound wise, things are also spot on, with a raw, energetic approach giving the likes of ‘Killing Ground’, ‘Live To Rock’, or ‘And The Band Played On’ the right amount of thump, while the ever present clarity allows ‘Attila The Hun’, ‘Dallas 1pm’, and ‘Let Me Feel Your Power’, to caress as they steamroller over you. In fact the mixing and mastering from Jacky Lehmann provides one of the best “in concert” sounds I can remember, with everything sounding “live”, yet refined. Obviously the set-list reads like a ‘best of’ from the Saxon canon, with old tracks ‘Wheels Of Steel’, and ‘Crusader’, mid-career romps, ‘Solid Ball Of Rock’ and ‘Dogs Of War’, as well as newbies ‘I’ve Got To Rock (To Stay Alive)’ and ‘If I Was You’, all gelling amazingly well, leaving the only conclusion to be that Saxon have never been anything less than excellent live, or in the studio. The only regret I have regarding this stunning release is that I wasn’t quite quick enough to snap up the already sold out 4DVD version that contains the main DVD in this set alongside the full shows from each individual year it compiles. Yes, it really is that good.